This is a universal many-to-many multilingual cross transcription system that is capable of generating high accurate transcription between more than 150 languages, a system that uses sophisticated techniques of processing both the input name and the phonetic conventions of the target language, thus producing a wide range Latin and non-Latin based languages versions of the name by taking care of all the complexities of their phonetic systems. All EU official languages, Slavic languages, Russian, Semitic languages e.g. Hebrew, and Hamito-Semitic e.g. Amharic and Tigrinya, Farsi, Hindi are among the target languages to name just a few. 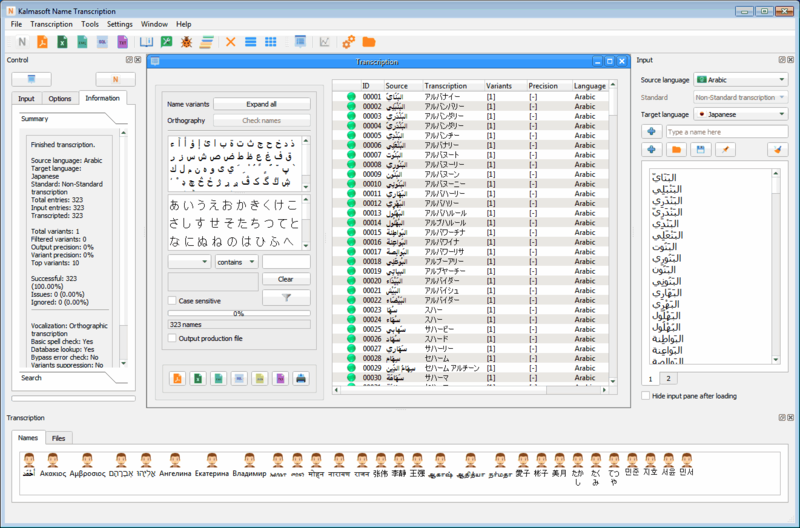 Depending on the intended field of application, the system can transcribe names between any pairs of the supported languages, it can also transcribe the names using some 23 transcription/transliteration standards for 16 languages including (UNGEGN, ALA-LC, DIN, SATT, ISO, Nihon-Shiki, Kunrei-Shiki, Transliteration) for Arabic, Russian, Japanese, Korean, Chinese, and Greek for example.